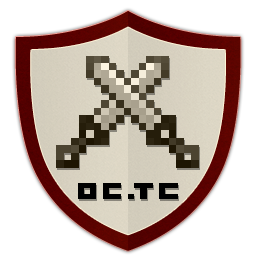 As of 2016, I have moved on from the minecraft modding community and left the maintenance of my mods in the capable hands of covers1624 with whom I have regular contact. Thankyou for all your support over the years. 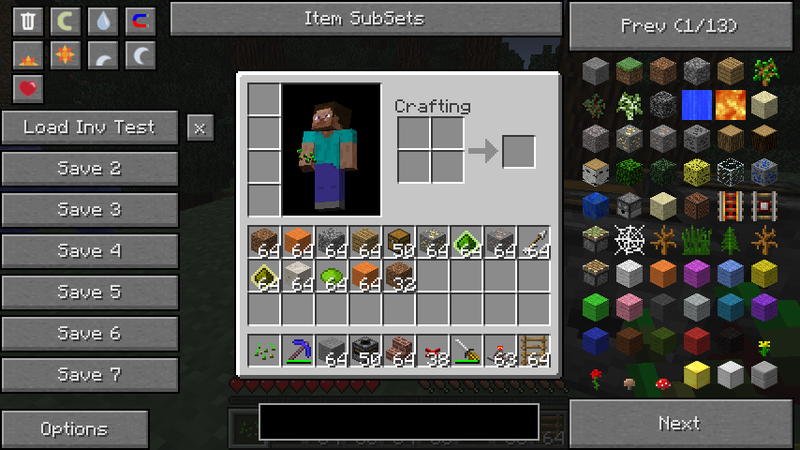 As of 1.8, Not Enough Items is now an add-on to the Just Enough Items mod and therefore requires JEI to be installed. Go check out the Discord for bug reports and questions. I have spent hundreds of hours working on these mods. I loved every bit but if you'd like to show your appreciation for my effort and time spent creating these mods. Please donate. If you'd like a little note like sponsored by... or want me to prioritise a certain feature you are more then welcome to include a short message with your donation. CodeChickenCore will automatically download a dependancy, CodeChickenLib, into your mods folder. Do not get spooked out. All mods go in the mods folder. Throwing CodeChickenCore (obfuscated or dev) into the /jars/mods folder of your mcp environment will enable you to throw any other obfuscated mod into your mods folder and play with it in your dev environment. 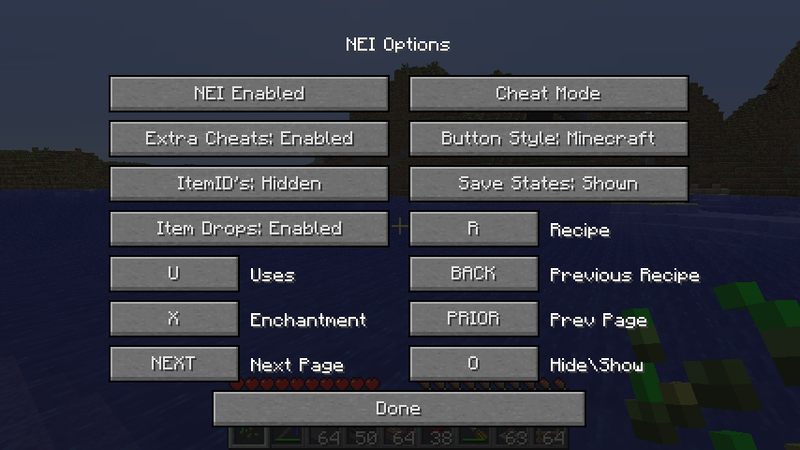 Yes this means you can test your mods with NEI in mcp just by throwing NEI and CCC into your mods folder. Developing with my mods is now even easier. Simply download the dev package, put it in /jars/mods and link it in eclipse or whatever IDE you use. For recompilation, just put all the dev versions in /mcp/lib as well. Just throw this in the mods folder. The following public release contains some libraries that I believe may be of use to other modders. All source code in this package is provided to any modder under the following conditions. 1. The modder notifies me the first time they decide to use any code from this package in their mod. 2. All classes that are used must retain their original name and be MOVED to a DIFFERENT package containing "codechicken"
3. The modder may use as many or as few classes from this package and modify them as heavily as they wish. Just move the classes you want to another package and include them in your mod, there will be no conficts or dependance on CCC if you put them in another package. Other CodeChickenCore sources are released under the same conditions as above with the following exception: They need not retain their original names, and may be incorporated, in any modified partial form into your own classes. If they do retain their original names however, they must be repackaged so there are no conflicts. If you want to make a mod that simply includes my version of CodeChickenCore as a dependancy (and don't want to package sources into your mod). Go ahead! There are no conditions on dependancies. Different 3D modelling programs export with different coordinate systems. 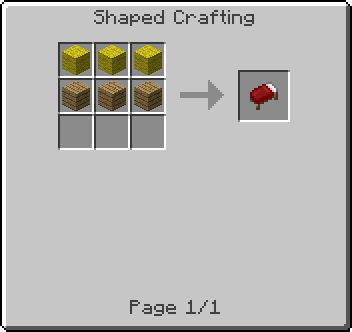 Minecraft uses a another strange one. Commonly try passing a new YZSwap() to the coordinate system parameter of the object loader. A good mod spotlight highlighting most features of the mod by Direwolf20. Another mod Spotlight by Phobic Bus with information on how to install. A third mod Spotlight by iPodmail. Please note that this does not REQUIRE CodeChickenLoader. Now you're probably thinking, I've seen TMI before, what a ripoff. What makes this one so much better? For a detailed explanation read on. A simple list is below. 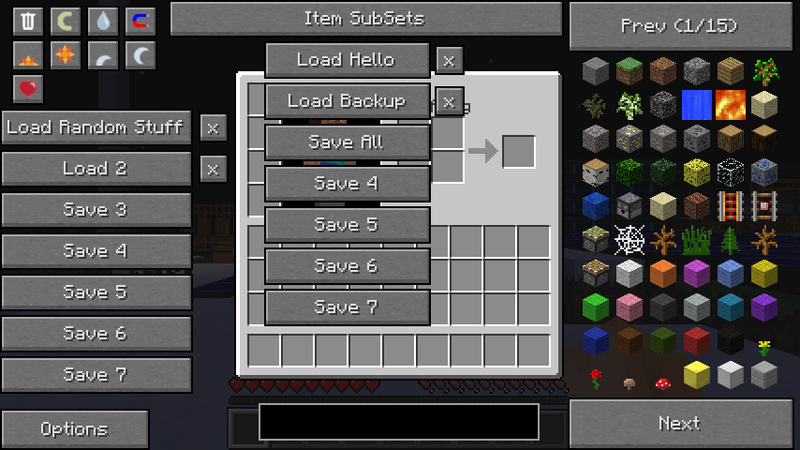 If you rightclick on the Item Subsets button the buttons for saving subsets will appear. These function identically to the normal save states, renaming, save\load\delete, but they will save and load the items you have hidden and shown. 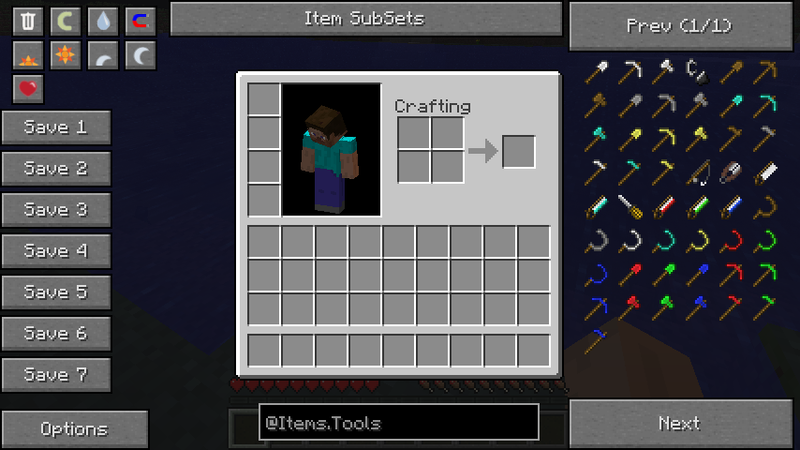 You can also add your own sets using the config file located in ".minecraft\config\NEISubsSet"
By pressing the enchantment key (default X) you can bring up the enchantment selector gui. 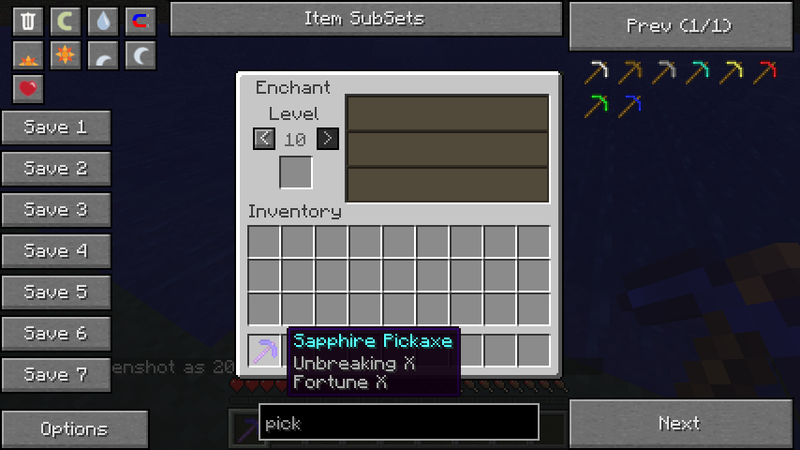 It allows you to put an item in the slot and select the enchantments and level that could be applied from an enchantment table. 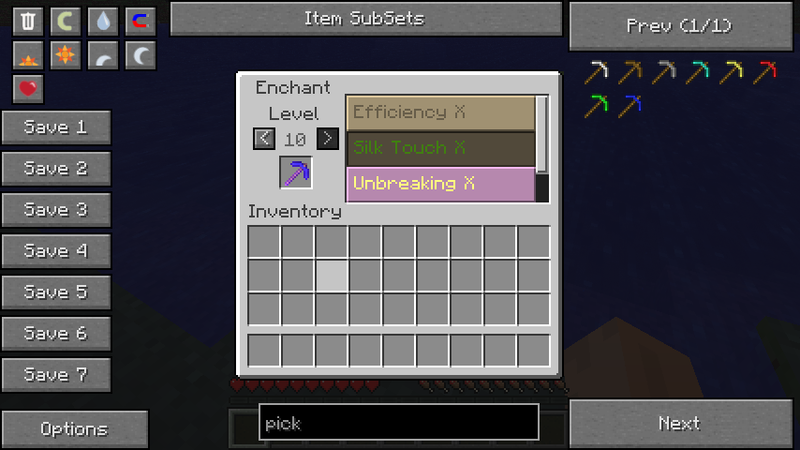 The level can go up to a maximum of X. Clicking on an enchantment toggles it on and off. 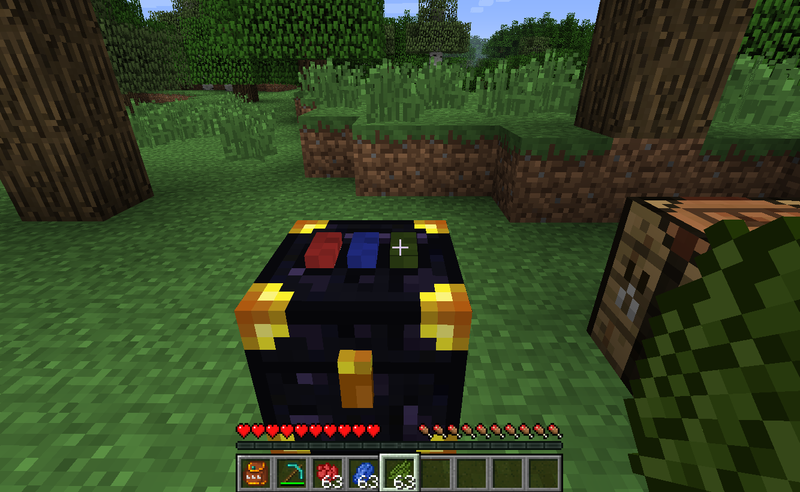 (To prevent unnice bugs)The normal multiple enchantment conflict rules apply so you can't have fortune and silk touch together etc. Unfortunately due to space limitations some names have had to be shortened, Projectile to Proj, Protection to Protect, Bane of Arthropods to Arthropods. 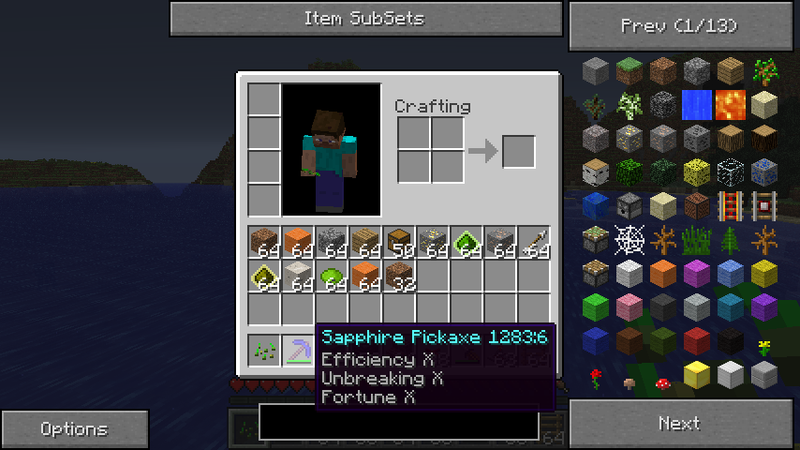 Enchantment names will only be shortened if there is not enough space. Eg Protection will be shortened to Protect if you set level 8 because VIII takes up a bit of space. Again another self-explanatory button, if it's raining right now this button will be enabled activated. Clicking it will change the rain to on or off. The last of the toggle buttons. 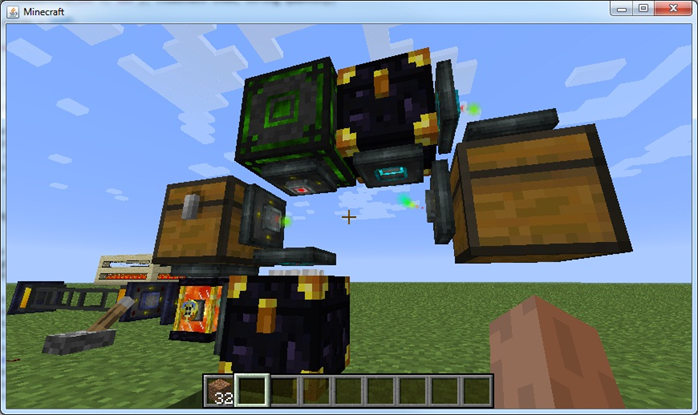 When magnet mode is enabled any items within a reasonable distance will pick themselves up and fly towards you. 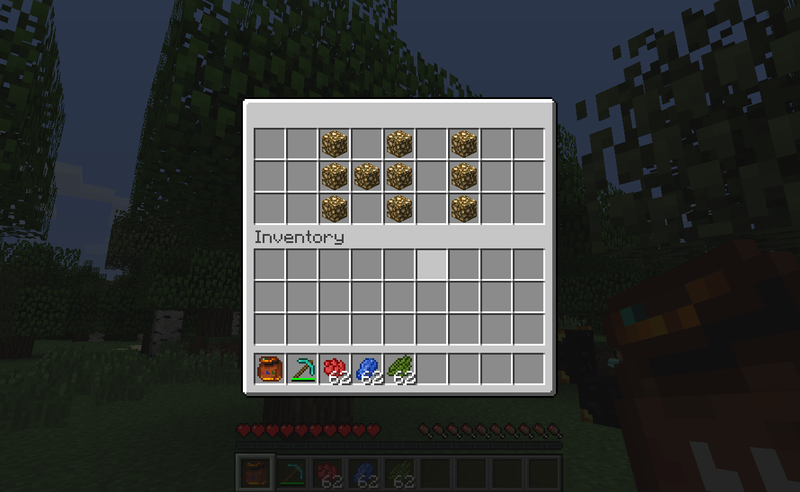 Items wont be attracted if they can't fit in your inventory though. 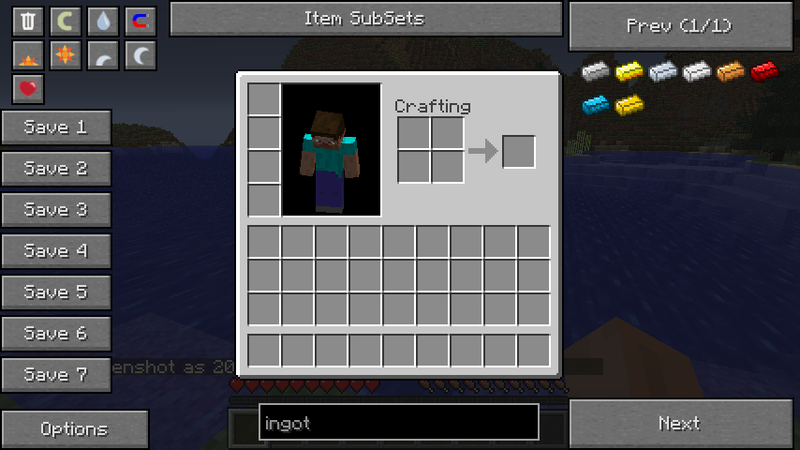 The first Button Toggles wether NEI is Enabled or not. If it's not enabled you wont be able to see anything except the options Button. The enabled state is separated for SMP and SSP. This option will cycle between Shown, Auto and Hidden. Auto will show ID's only when NEI itself is shown and enabled. 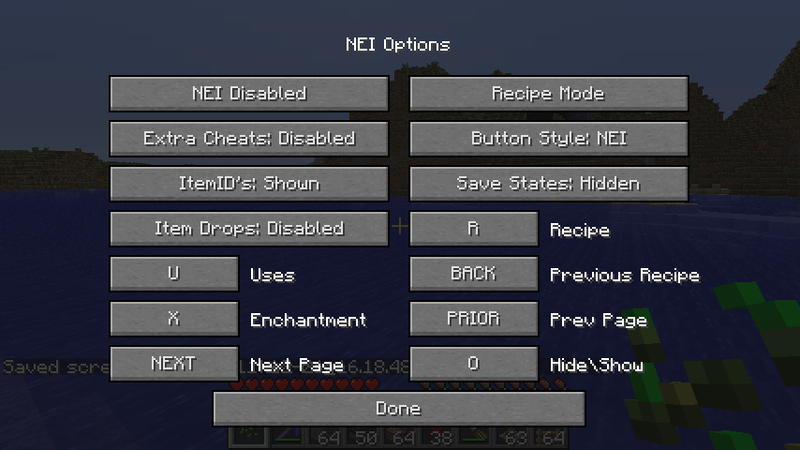 There are many options in NEI that can be configured in "config\NEI.cfg". Note that most of these are editable in the options menu. A configuration file will be generated in config\NEIServer.cfg containing various confiutation options for servers. The config file comments explain the functions. In short it allows you to assign certain functions to be used only by certain players. 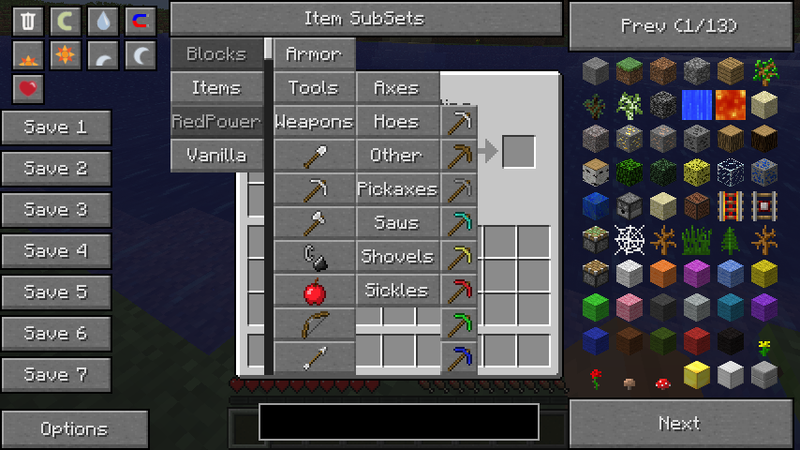 So you can select who can use OP enchantments etc. 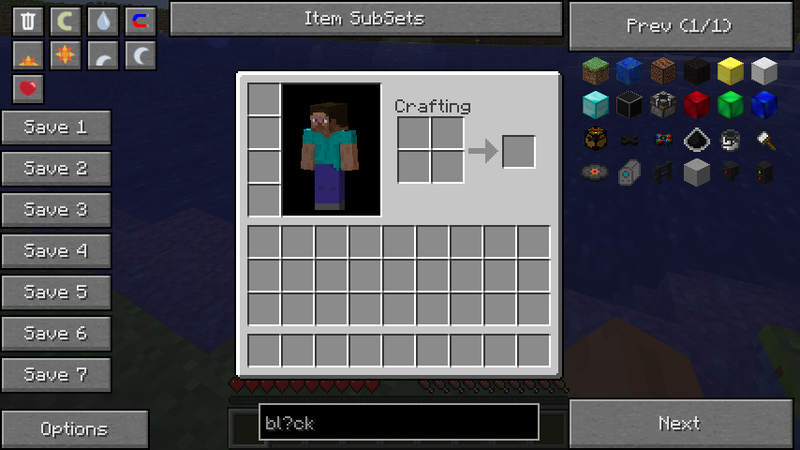 There is also a banned blocks section, any blocks that are banned wont show in a user's item panel. 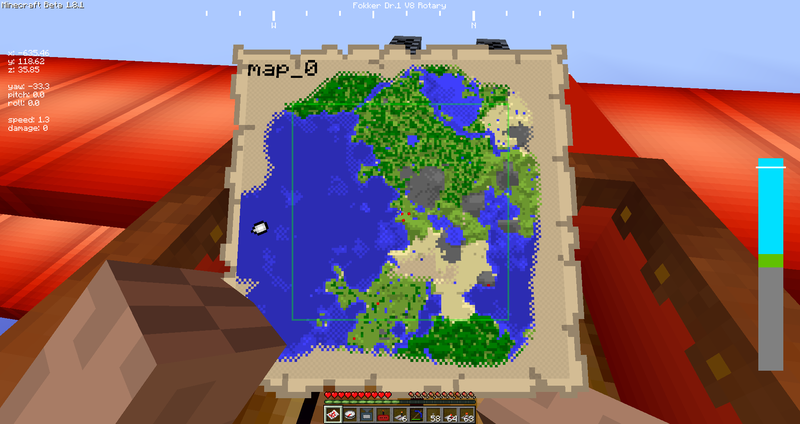 Bedrock is banned by default so connected users can't spawn bedrock, (unless you specify their name). 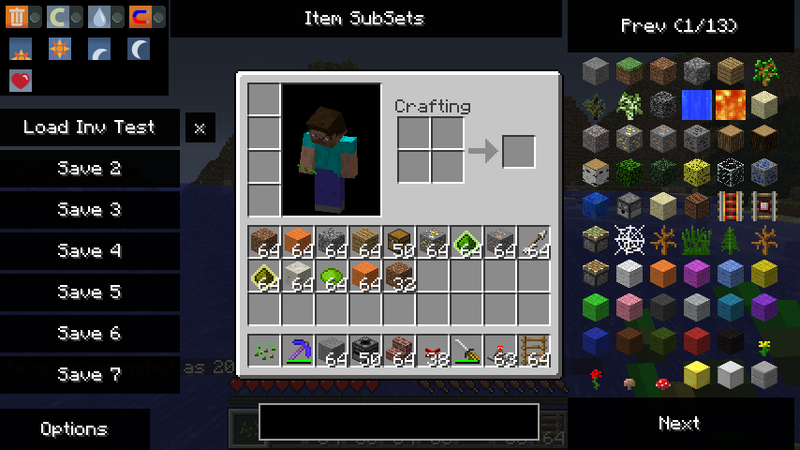 Extended API There is an extended API built in to NEI to allow mods to integrate properly. 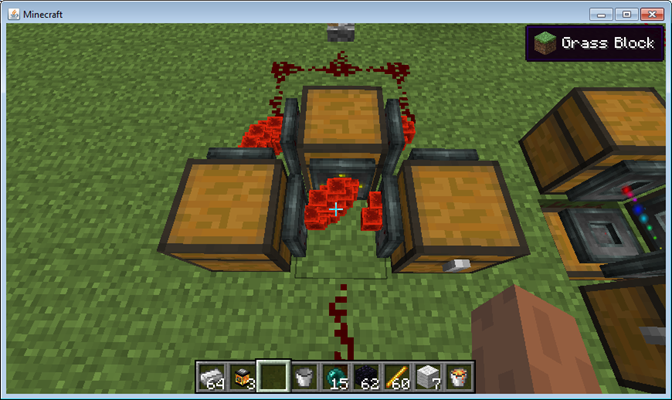 This is demonstrated with the RedPower module that provides Alloy Furnace recipes and RedPower specific subsets. 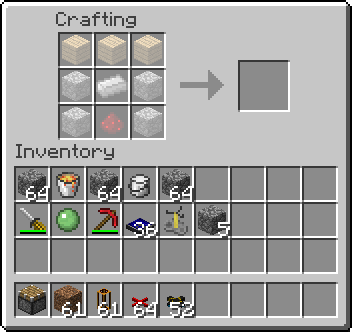 I am aware that there are many different crafting inventories out there. 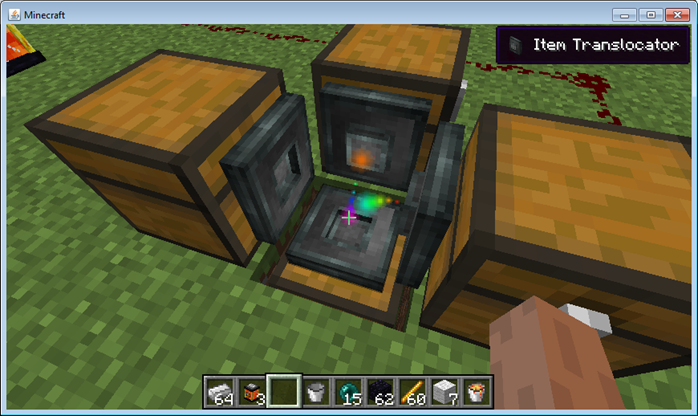 BTW's anvil, IC2 has a bunch etc. 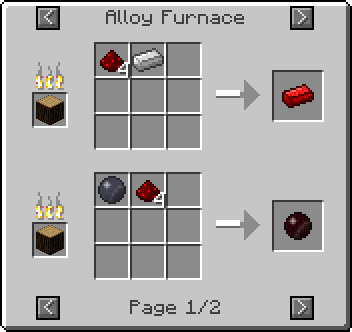 However I only use the Alloy Furnace from RedPower. 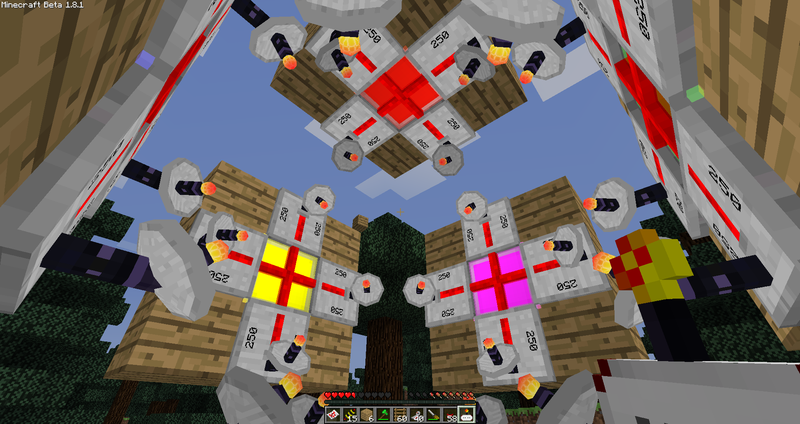 Therefore I welcome modders who want to make small modules like the RedPower one for various other mods. 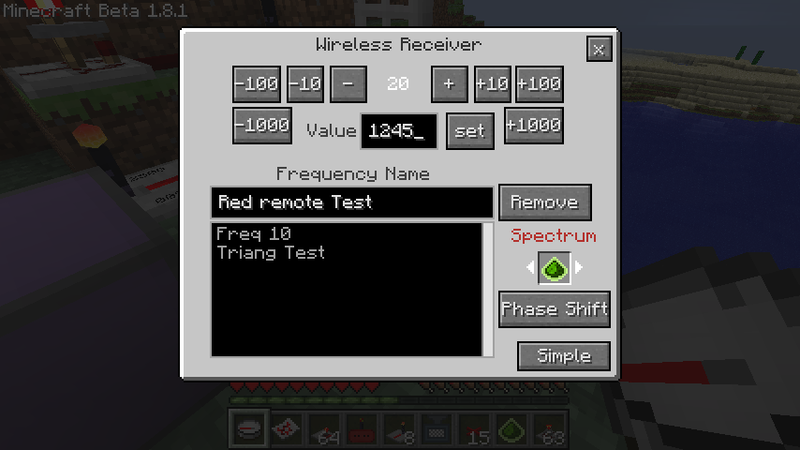 Due to Eloraam's kindness she has permitted this small module that will add features to NEI from RedPower. 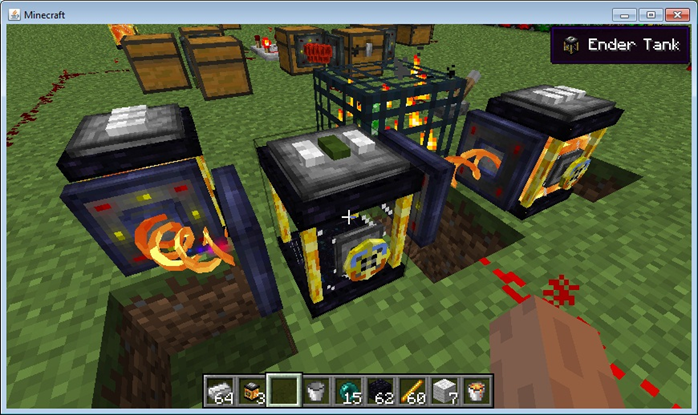 It will add the RedPower dropdown tags you see in the screen shots, Show all types of microblocks and redwires and add the Alloy Furnace recipe handler. Install it if you have RedPower. Same as the rest of my mods, place the jar in the mods folder. An install video is in the spoiler below. 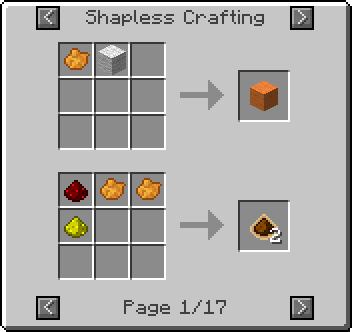 Credits Inspired by TooManyItems and Recipe Book. Many friendly and supportive Beta Testers. As of 1.2, Using a diamond on the latch of an Ender Chest will move it to a seperate network for the player that used the diamond. 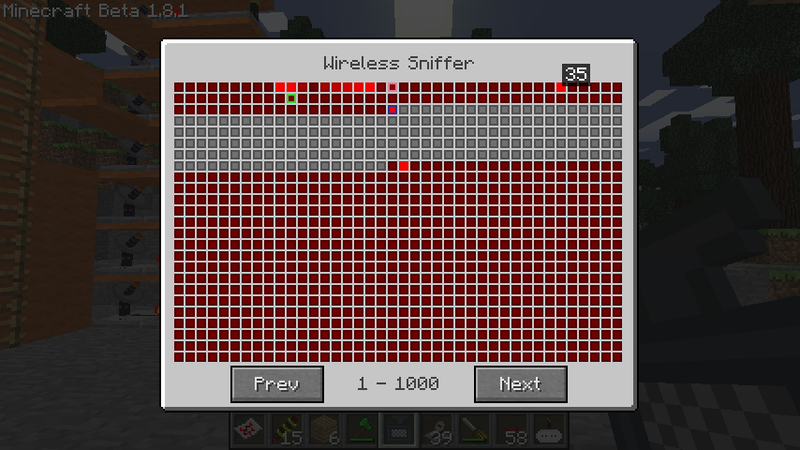 This allows each player to have acceess to all 4096 frequencies without conflicting in SMP. Now you're probably thinking, I've seen a mod like this before. What makes this one so much better? For a detailed explanation read on. A simple list is below. 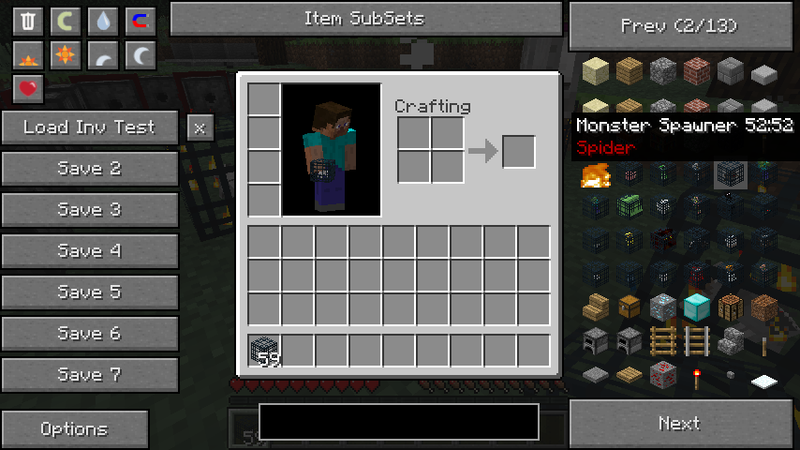 A nice mod spotlight by Direwolf20. A mod spotlight by pcmaster highlighting a few more of the applications of WR-CBE. 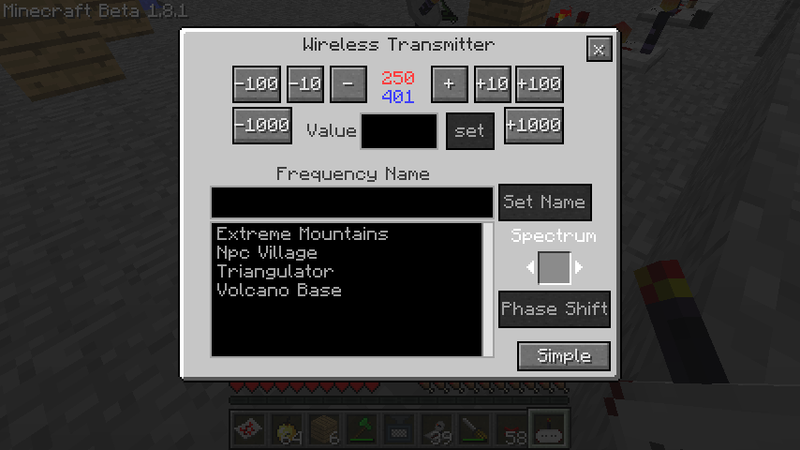 The much requested feature to assign names to frequencies is here. It's fairly intuitive, just look at the screenshot above. Anyone who doesn't have permission to access a freq will be shown a greyed out square on their sniffer. They will be unable to set any device to that frequency. However they can still use devices set by other players. What more can I say, Epic huh. The Wireless Bolt is generated by jammers and REP's. The bolt will "jam" any devices nearby preventing them from working. Transmitters will stop transmitting, receivers will stop receiving and any devices a player is carrying will no longer work. Dont worry the effect lasts for a limited time period. For some reason cognitive processing causes a detectable effect in the Redstone Ether and a the bolt will also seek out nearby mobs and players dealing damage in the process. Fortunately more intense cognitive abilities provides some resistance to the effect, so players wont take as much of a blow as that sheep over there. 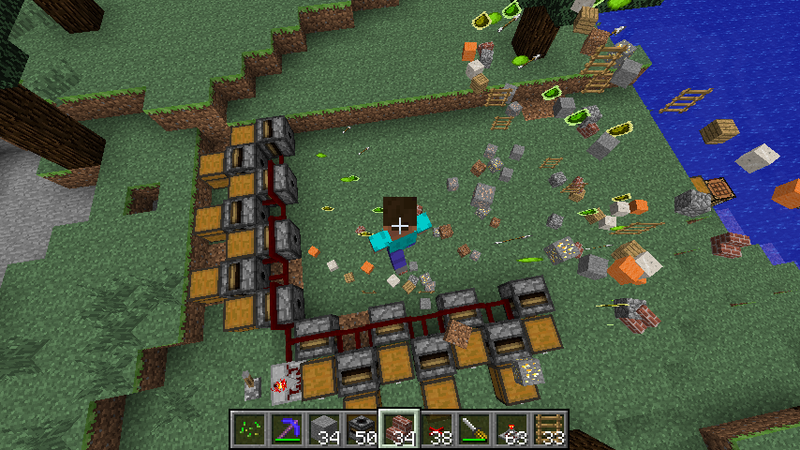 Wreak havoc on your fellow player's wireless contraptions or make a visually entertaining mob trap. There is a green beacon in the desert, an orange beacon in the forest and three red beacons near the center. And yes I'm in a plane. 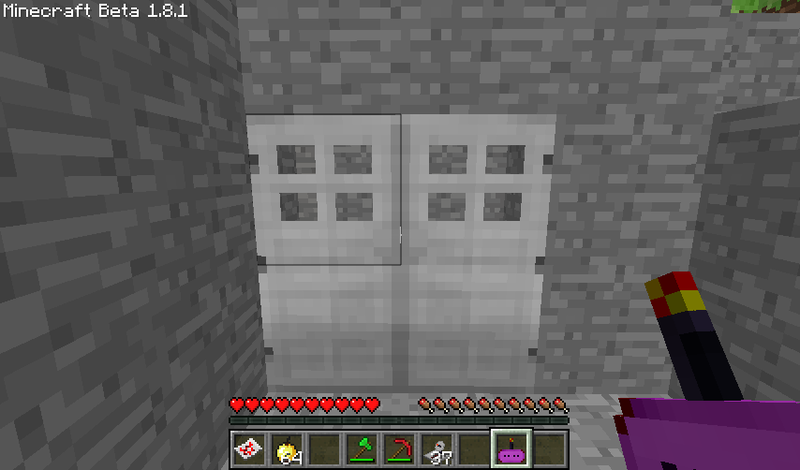 These guys will even stay stuck to players through portals and between logouts. 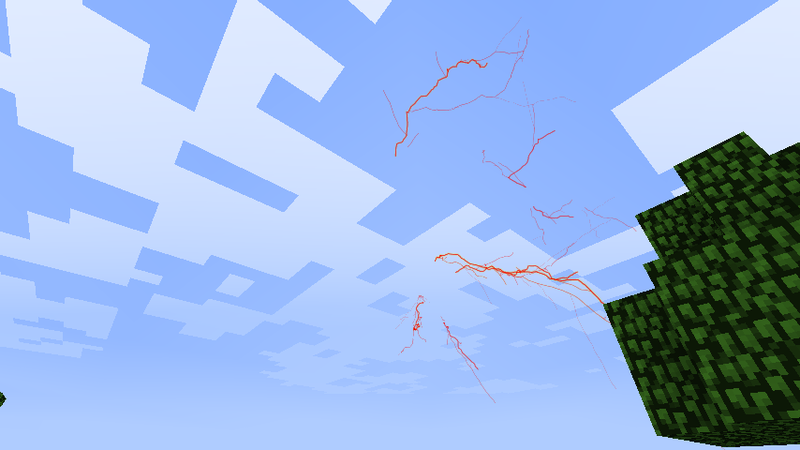 However if an entity is 'unloaded' or a player is logged out the tracker will dissapear until the entity returns. 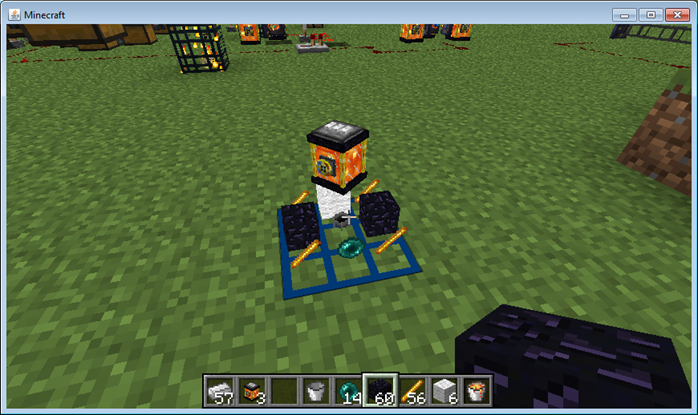 Trackers can be removed from an entity by pulling them off with a sticky piston or by melting the adhesive with fire. Once the tracker is no longer sticky it will spin like an item and can be picked up. Note that the tracker will quickly cool down and revert to it's normal sticky state. 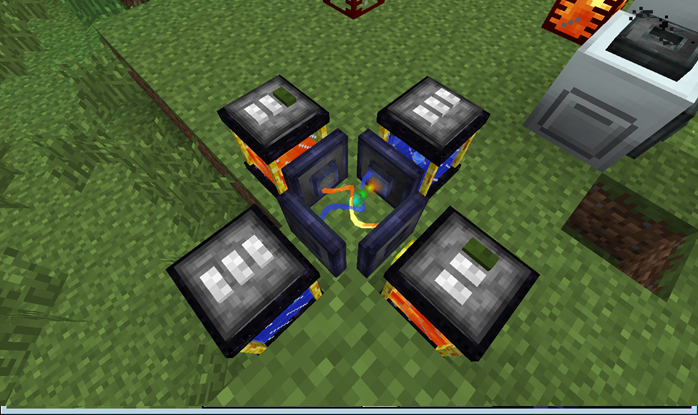 Formerly known as WR-CBE Redpower, this module contains the blocks of the mod. It requires ForgeMultipart, an open source multipart library to be installed and allows the tiles to be placed on walls and ceilings with covers and other multiparts. 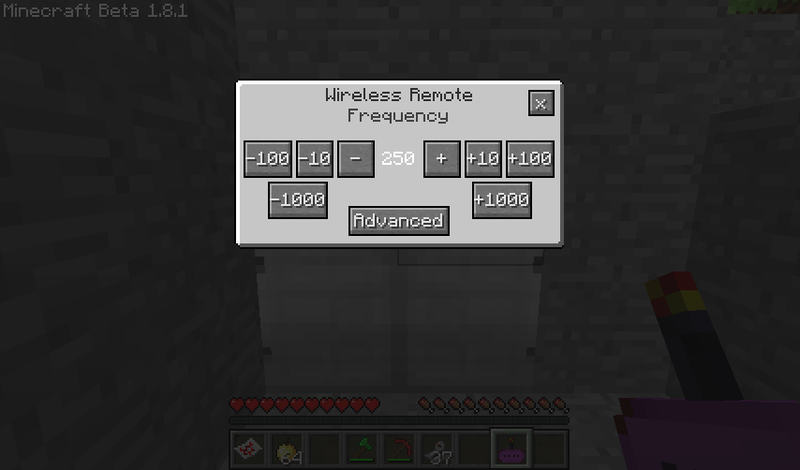 Credits Aliaz - Original Wireless Redstone mod. Danny494 - Textures for REP, Sticks, Bowl, Map, Sniffer, and a lot of texture drafting\base textures. Alexandria, madindehead, Kenny - Beta Testing. 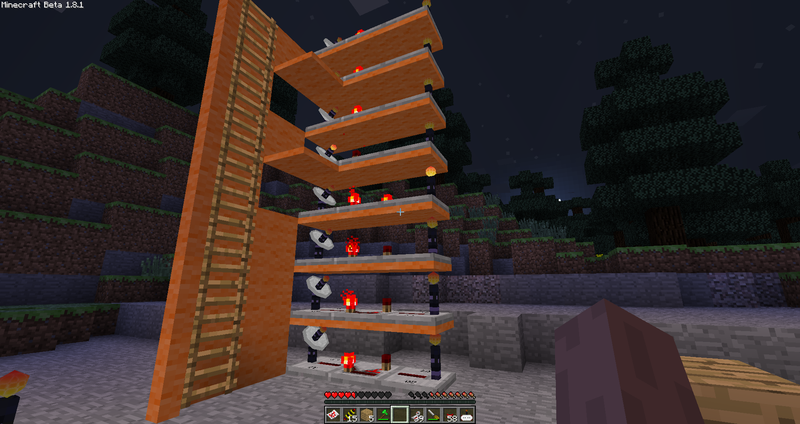 So you've seen a few of these things around before, Teleport Pipes has one, Railcraft has two. Immibis has one. Here's a short feature list. 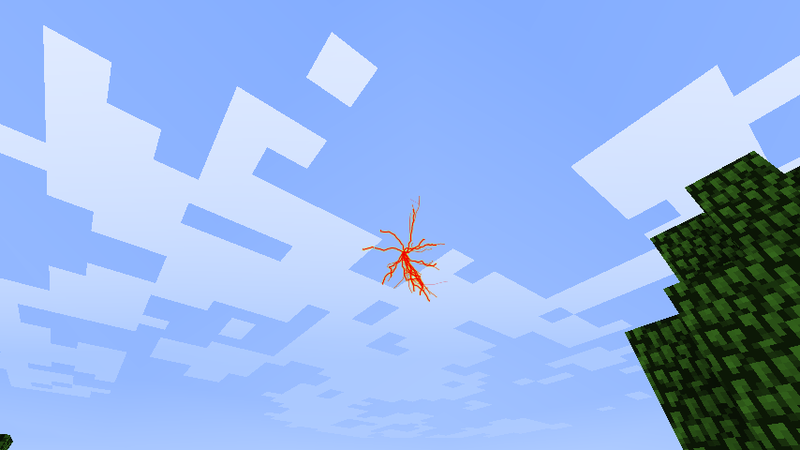 100% not buggy guarantee (I'll fix it if you find a bug). The shape is either Circle, Square, LineX or LineZ all of which are self explanitory. A radius 3 with square will load a 25x25 chunk area. Q. When will your mods be updated? A. When it's done or a week after the last person asks, whichever comes later. Don't expect all your mods to be ready for at least a month. A. Install Code Chicken Core. Q. I can't spawn items! Q. Can we have wireless bundled cables (or any other variant)? A. No, it involves lots of code and design, would be very difficult to integrate nicely and is quite overpowered. Q. I get a saving chunks or black screen. ur mod sux cuz it r no wurk. A. Logs or it didn't happen. If you want me to help you with problems you are having with any of my mods do everyone a favour and follow a few steps first. 1. Make sure you have a running FML/Forge installation. 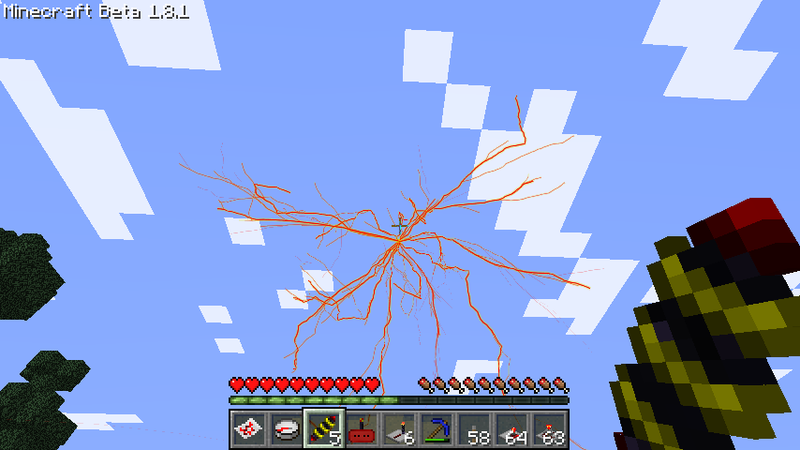 If you have that then I can rule out all prerequisites to this mod like failing to delete Meta-INF or install FML. 2. Tell us what happened. And if it's a visual glitch what you can do to cause it to happen. 3. Get us an FML or MultiMC log. You should be able to find FML logs in your .minecraft folder. 4. Post the information on the thread. Always use pastebin for logs. Victorzimmer for giving me an ftp server to host on. While any of my mods should not destroy your world, I take no responsibility for damage done to your minecraft your world or the chair you are sitting on. Not to offend Marglyph or anything, but I actually prefer NEI over TMI. Could it be? I get to taste some more Chicken before the year ends? 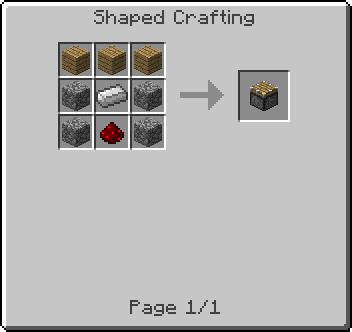 I really want NEI back, TMI just doesn't help if I wanna stay legit to the game, NEI is simple while having an option for people that don't want to cheat with the enchanting and crafting. D: Hope I can download soon. People tend to hate me without ever meeting me. This makes me pity said people. Good to see you ( and the cute kitten ) back :smile.gif: I really hope all this NEI TMI stuff will be over soon, I can't go back to TMI, I refuse to, NEI is too amazing to ever go back to something so terribly underwhelming. And yes I hope it will be over soon too. There was something I wanted to post. it won't give you the recipe until you clear the search. 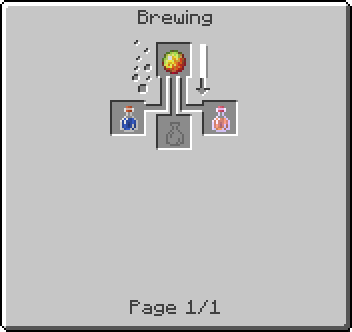 5% of the items don't have recipes. So sad to hear about NEI, I hope as well it is back soon. 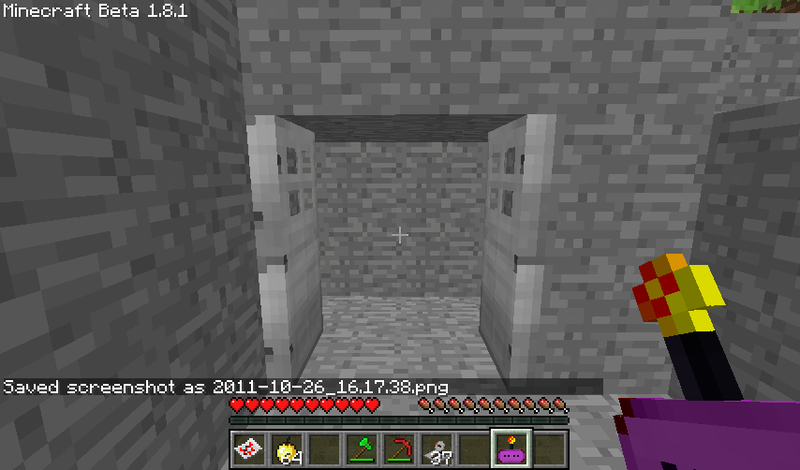 I do have a bug report in NEI, and I would have looked through the threads to see if it was already posted =) but.... 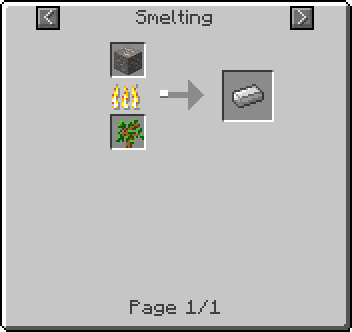 So in SMP when someone is in the overworld and then goes goes to the nether they are allowed to generate items, same when they come out of the nether. This is with all options in the config set to none for all players. Am I missing something in the config or is this an actual bug? It seems your client download for chicken core gives me a 404 error after the adfly. i can't view the discussion with marglyph. i want to read it though.. The link to your CodeChickenCore files seems to be broken. the link is infact down, cant wait for it to be back up so i can use this!